Photos by iCrates, and see more here! Music Hack Day Berlin was last weekend (May 28th and 29th) and was packed full of cool hacks and people. In case you aren’t aware of what Music Hack Day is, it’s a scheduled weekend when programmers, designers and artists come together in a venue and create music-related apps for consuming, exploring, creating and manipulating music. Below, you can take a peek at some of the cool hacks a few attendees came up with. CloudComments: SoundCloud intern, Marco Hamersma made a very cool hack — audio comments on blogs! So in addition to writing a comment, you can also let your voice be heard with this hack! It isn’t completely music-related but it’s sound related and we all know sound is musical :) Read more on his hack here and watch the demo! Tractor: When you’re browsing a page about a certain artist, why not learn more about them? You can do this with the Tractor hack. Music Haeckel Day: Remember when we listened to music on cassette tapes? Do you have any lying around your house? Well, a group at Music Hack Day combined urban crocheting and music hacking to deal with these old tapes. The group digitized the music on their cassettes and crocheted them into the streets of Berlin. If you find these areas and scan the code with your smartphone, you’ll be able to hear the track that was on the cassette before. Check out the nice website they made dedicated to their hack and the artwork player below. RecordTag: MuseScore, a free, open source music notation music, was inspired by the timed-comments available on SoundCloud and decided to apply it to their own platform. Now, collaborating with sheet music is easier because you can add comments on certain parts. Check out this screencast to get a better idea and there’s more information on the hack here! You can watch out for a Music Hack Day coming your way here – or even organize one in your city! If you’re in or around Barcelona, there’s one coming your way very soon (16th and 17th of June)! More details here. Music Hack Day Berlin 2011 was sponsored by MTV Networks, Ableton, Spotify, Native Instruments, wahwah.fm, FAW, Songkick, Musixmatch, 7digital, and Echonest. SoundCloud Come and say hello! It’s that time of year, conference season (when isn’t it?). For us, that means a few of the SoundCloud team get to escape the icy streets of Berlin and pack ourselves into various exhibition halls (and bars) meeting new people and thrusting business cards into their hands. For you, it’s a chance to come and say hello. That’s the best part, so don’t be shy! Whether you’re press, companies, partners, creators – or you just want to meet – then here’s where we’ll be at. CES (6 to 9th January) – Tablets, 3D TVs, robots? I wonder what new gadgets you’ll be able to use SoundCloud on in 2011! Meet with Alex as he takes in all the wonders that Vegas has to offer. NAMM (13 to 16th January) – NAMM is the mecca for all the companies that sell the gear that help you make the music. Henrik & David Adams will be hanging out with our friends at the PreSonus booth (Hall A – 6800), giving demos. Eurosonic (14 to 15th January) – Want to hang out with the European music industry and check out hottest up and coming bands at the same time. Then the lovely Dutch town of Groningen is where you need to be at. Meet with David Noel, he’ll be taking part in a panel on the Saturday too (more details coming). Midem (22 to 25th January) – We’ll be there, along with a growing contingent of digital music companies at what is still the definitive international conference for the music industry. We’re extra pleased this year to be playing a big part in the Midem Hack Day. More hacking, less talking! Meet with Dave, Eric and Alex. DLD (24 to 25th January) Digital – Life – Design. 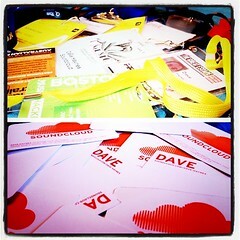 Alex will be hopping from Cannes to Munich to meet up with the movers and shakers of the digital world. SXSW Interactive & Music (11 to 18th March) For better or worse, SXSW looks set to be even bigger this year. Whether you’re going for the insight of Interactive or the hot new bands at Music, we hope you’ll be there to say hello. Dave will be giving a dual presentation during Interactive entitled ‘Love, Music & APIs’ and Alex should be there too. With a lot of new integrations on the way and Music Hack Day coming up in Stockholm this weekend, we wanted to shed some light on what we call Connect with SoundCloud. The idea is to make it really easy for users to connect third-party apps and services to their SoundCloud accounts and thus get an even better flow for handling audio on the web. Connect with SoundCloud is built on OAuth – “An open protocol to allow secure API authorization in a simple and standard method from desktop and web applications” – also used by Twitter and YouTube among others. The main benefit is that you don’t have to store your SoundCloud login credentials in any third-party app or service. Click “Connect with SoundCloud” in the third-party app. This opens up the connect page on our server. You can login (or sign up for a new account) and allow access. An authorization token is sent to the third-party app. The app can store the token and access the account until the user revokes the access in the SoundCloud account settings. That way you’re able to revoke the access without changing your SoundCloud password and also to change your SoundCloud password without affecting the third-party authorization. So when you see this button on a web page, you know that you’re only two clicks away from connecting the service to your SoundCloud account and let it accessing to your tracks. Check out the general description of Connect with SoundCloud. Read the guide for implementing and the API documentation. Make sure you get the right buttons.